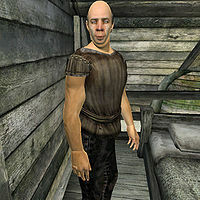 Reistr the Rotted is a Nord pauper and a skooma addict living in the Skooma Den in southeastern Bravil. In typical Nord fashion, only slightly accentuated by the skooma, he tends to speak very loudly and publicly about an embarrassing itch on his thigh. He is so addicted that he never even leaves the Den and spends his entire life downing Skooma while telling the other addicts about his itch. He sleeps in the upstairs area every night between midnight and 6am. He starts the day with two hours without Skooma, but at 8am he pulls out the bottle and starts drinking. He keeps going for a whopping twelve hours until 8pm, when he just staggers around the Den until his bedtime at midnight. He wears simple, pale lower-class clothing consisting of a belted vest with blacksmith's pants and stitched leather shoes. He carries his stash of 5 Skooma bottles, a small amount of gold and his indispensable mug. When you approach him, he will keep drinking but will tell you about himself and the itch: "Hey! That's me you're talking to! Reistr the Rotted! Hear me? Reistr! Wow! I got this a-MAZ-ing itch right on my thigh! Can't touch it! It's rough!" When asked about Bravil, he will get paranoid and let the Skooma talk: "Been here. Right here! All day! Last night, too! I wasn't there! Not there at all! I can totally prove it! Ask anyone!" Like all other inhabitants of the Skooma Den, Reistr can be killed without incurring a bounty as long as no other people (besides the other Skooma addicts) are around. This is a great way to join the Dark Brotherhood.